SAIC Compass: A new online platform serving as a central hub for students and alumni to create professional profiles, connect with employers, search more than 500 internship and job opportunities, register for career-planning events and make individual and group advising appointments. Expert Exchange: A weekly program featuring creative professionals, entrepreneurs and business leaders mentoring SAIC students in half-hour conversations. Topics include starting a business, finding a first job and building a professional creative practice. What’s My Job? : Panel presentations featuring SAIC alumni on the path they took to their first position after completing their undergraduate degree. Panelists share insights about working for some of Chicago’s leading cultural institutions such as Museum of Contemporary Art, Leslie Hindman Auctioneers and Havas Worldwide. Internship as Professional Experience: A new academic course that blends a weekly class meeting with 150 hours of internship participation. More than 400 SAIC students complete for-credit internships each year, hosted by leading companies and cultural organizations throughout Chicago and around the world. Outreach to employers in the Chicago creative community and beyond that will deepen the school’s engagement and expand opportunities for students. 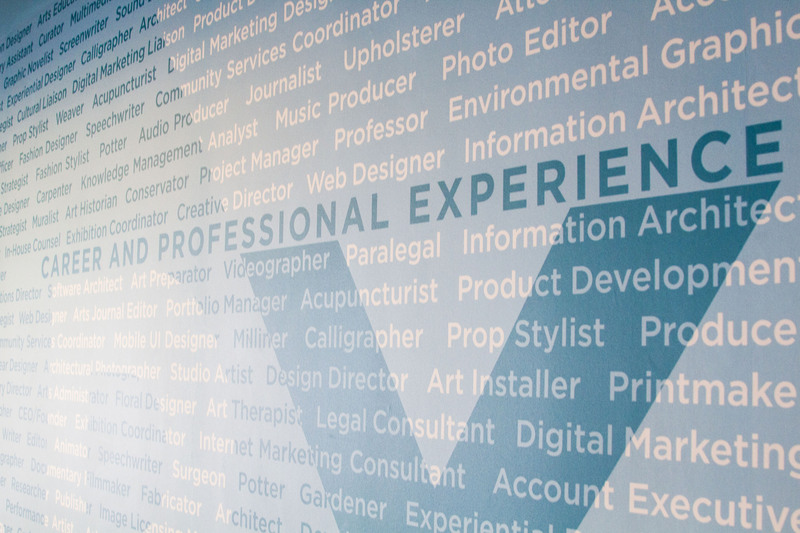 In addition to programming and resources, the CAPX office, located at 116 S. Michigan, 14th floor, recently unveiled a wall mural featuring 136 job titles of SAIC alumni. The goal of the mural, which lists a diverse selection of jobs including surgeon, cinematographer, founder/CEO, tattoo artist and fashion designer, is to help students imagine life beyond SAIC’s classrooms and studios. For more information on CAPX, please visit saic.edu/careers. For 150 years, the School of the Art Institute of Chicago (SAIC) has been a leader in educating the world’s most influential artists, designers, and scholars. Located in downtown Chicago with a fine arts graduate program consistently ranking among the top programs in the nation by U.S. News and World Report, SAIC provides an interdisciplinary approach to art and design as well as world-class resources, including the Art Institute of Chicago museum, on-campus galleries, and state-of-the-art facilities. SAIC’s undergraduate, graduate, and post-baccalaureate students have the freedom to take risks and create the bold ideas that transform Chicago and the world—as seen through notable alumni and faculty such as Michelle Grabner, David Sedaris, Elizabeth Murray, Richard Hunt, Georgia O’Keeffe, Cynthia Rowley, Nick Cave, Jeff Koons, and LeRoy Neiman. For more information, please visit saic.edu.